The Get #GirlConnected screening and panel discussion on gender biases was truly a global conversation. Audience members hailed from every corner of the globe: Haiti, India, Kenya, Israel, Guatemala, Canada, Cote d’Ivoire, and major cities around the US. Classrooms in Colorado and Virginia, domestic non-profit organizations working with at-risk youth and victims of sexual exploitation, and international development organizations focusing on empowerment & gender equality, such as USAID, Rise Up, Akili Dada, Creativity for Peace, and the Peace Corps, engaged in conversation on how we, as a global community, can empower women and girls to transcend gender stereotypes. Our five inspiring girl panelists came from inspiring organizations and represented cultures from all over the world. Michelle is a Kenyan STEM student and one of the girls featured in the film, Girl Connected. Chelsea is a New Yorker HerLead Fellow with Vital Voices. Yaara is an Israeli peace leader working with the non-profit, Creativity for Peace. Aarti is an Indian change-maker with Ashoka Youth Venture. And lastly, Alejandra is a Guatemalan teen with Rise Up Together who is using radio to speak out on sexual violence. Belinda Goldsmith, the Editor-in-Chief of Thomson Reuters Foundation, moderated the conversation, and began the discussion by asking the girls panelists how they connected to the film, Girl Connected. Each girl leader explained that they realized something was wrong in their community and believed they needed to stand up for an issue. They came to understand that had the power to make a change. “Women in my culture are discouraged from being too bold, too outspoken, so we find that women going into STEM or activism are viewed as problematic or not ‘proper’. As a women you are not supposed to intimidate, and there is a lot of backlash,” Michelle explained. Every young women panelist shared their painful experience of encountering gender biases, and the reactions they experienced when they pushed against that boundary. But within the struggle to overcome gender biases, our young women activist stayed optimistic and shared their hope and words of encouragement. “I think that every girl, if she believes in something and wants to do something and has the passion, she needs to continue to do that- No matter what other people tell her”, Yaara exclaimed. The belief that they could pursue their dreams didn’t derive from just internal gusto, but from the village of supporters standing behind them cheering them. “The role that educators and mentors play is undeniable. They can challenge you and build that confidence in girls at an early age”, Chelsea stated. Each panelist expressed the impact their mothers and teachers had on their lives. Alejandra was so inspired by her teachers and school principle that she is now studying to become a teacher one day. Often, it was their mother who was the first to believe in them and their dreams, and pushed them to pursue it. “My mom was my first teacher. She has always supported me and she is with me in every step of my life”, Aarti said. Gender biases can feel like an overwhelming and colossal problem to surmount, and in many ways it is, but our panelists reminded us that the number one factor that builds inclusion and equality is creating spaces where women feel empowered. Those spaces are the relationships we form with one another. The support we receive from our relationships is not just important in the gender equality movement, it is vital. The conversation reminds us to reach out to our sisters, cousins, aunts, teachers, mothers, neighbors, friends, and colleagues and reinforce to each other that we are of value, belonging, and love, and that our dreams are important. And the conversation needs to expand to our brothers, uncles, friends, grandfathers, and fellow community members on how they can each become agents of change. For sustainable change to occur, we ALL need to all participate in the global conversation on gender biases. Thank you to everyone that participated in the Get #GirlConnected screening and panel, near and far! 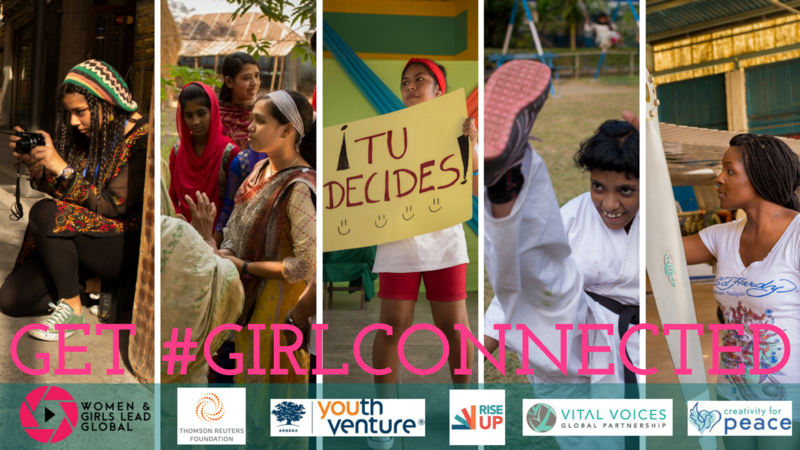 And a special thanks to our partners: Rise Up Together, Ashoka, Vital Voices & Creativity for Peace. The conversation is only just beginning. The Girl Connected Film & Engagement Toolkit are available online for FREE.